Like a giant blue whale, the great promontory of Howth Head basks at the entrance to Dublin Bay. In the curl of its tail, just a few miles from Dublin, there nestles a little fishing village, watched by the island called Ireland's Eye. This is the village of Howth. Beside the ancient ruins of its abbey stands the Abbey Tavern. Inside-an Irish welcome as warm as a friendly handshake, a tasty supper… a sup to drink…and music and singing with the fragrance of peat about it and the taste of truth in it. If you know the Irish, the warmth of the welcome, the fine food and drink, are probably just as you expected. The singing may surprise you. In a simple setting a handful of singers make the rafters ring with ballads grave and ballads gay, verses sly and verses simple, songs quiet and songs stirring. It makes a memorable evening! Jesse and Anne, who have been singing together for two years, regularly appear on television, and have done the musical background on documentary films. Recently they went on a tour of Germany with the other Abbey Tavern musicians. BUACHAILL O'N EIRNE a love song, first heard by Jesse on Innisheer (Aran Islands). Later, Sean og O'Tuama supplied both words and music. Although the composer is not known, it was translated by James Joseph Callanan, who was first to give adequate versions of Irish Gaelic Poems. THE CONNEMARA CRADLE SONG is a ballad of recent origin. The air I bears a marked resemblance to the American song, "Down in the Valley". GENERAL MUNROE was obtained from Colm O'Lochlainn's book of Dublin Street Ballads. This ballad describes one of the key engagements in the Ulster Rising of 1798, which did not begin until two weeks after the Wexford rising because of the arrest of some of the leaders. The rebels were defeated and Munroe, their leader, captured and executed. THE BEGGAR MAN vividly depicts the professional beggar who flourished before the Famine of 1846. BUACHAILLIN DHOUN is a very old Irish love song, the translation of which is The Brown Boy. Anne heard the song from her aunt, who is in the U.S.
GRA MO CHROI is also from Colm O'Lochlainn's book of Dublin Street Ballads and was particularly popular among Dublin singers around 1912. The trio comprises Margaret O'Brien (singer), Sean Loughran (guitar) and Paddy Roche (Guitar and banjo). They began singing together about a year ago. Since then they have appeared extensively on radio and television programmes both in Ireland and Britain and are regulars of the Abbey Tavern. THE SINGING BIRD is a beautiful old Irish ballad, the last verse of which is a comparatively recent addition to the original which Margaret first learned from the late Denis Cox, one of Ireland's greatest ballad singers. THE CROPPY BOY is one of the many songs written about the 1798 rebellion. Although there are, of course, many variations, the Ludlows claim this as their own original arrangement of the Wexford song. THE BALLYNURE BALLAD is a lively little traditional song from up north which gave Sean of the Ludlow Trio and Seamus Gallagher much pleasure in arranging. A four-man group composed of Louis Mooney (guitar), Richard Seaver (guitar), Owen O'Sullivan (banjo) and Charlie Murray (tin whistle). The Islanders derive their name from Skerries, their home town which lies north of Dublin. THE MEN OF THE WEST was written by Willie Rooney and describes how the men of the Western seaboard of Ireland, who were the last of the United Irishmen, made a last desperate stand to oppose British Rule when the rest of the country was suppressed. Al, whose contribution is "The Verdent Braes of Screen," is a former art student who began his singing career in Nottingham, where he gained valuable experience at the city's Folk Workshop. He returned to Dublin permanently a year ago. The 21-year-old singer normally accompanies himself on the five-string guitar. 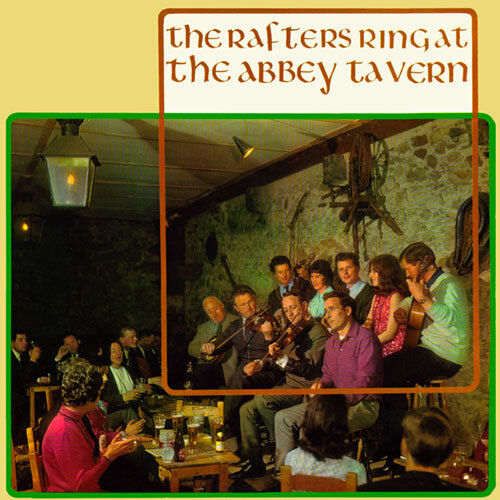 The disc opens with Two Jigs, The Lark in the Morning and The Knights of St. Patrick played by, Joe O'Leary (traditional fiddler), Seamus Gallagher (traditional fiddler), Bill Power (banjo mandolin), and P. J. Downes (spoons). Track Six is Slieve na mBan by Joe O'Leary (traditional fiddler) and Bill Power (banjo mandolin), and on track ten there are two reels, namely The Donegal Reel and Sligo Maid.